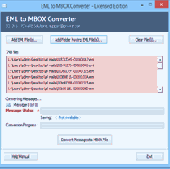 PCWin Note: Email Converter EML to MBOX Tool 2.0 download version indexed from servers all over the world. There are inherent dangers in the use of any software available for download on the Internet. PCWin free download center makes no representations as to the content of Email Converter EML to MBOX Tool version/build 2.0 is accurate, complete, virus free or do not infringe the rights of any third party. PCWin has not developed this software Email Converter EML to MBOX Tool and in no way responsible for the use of the software and any damage done to your systems. You are solely responsible for adequate protection and backup of the data and equipment used in connection with using software Email Converter EML to MBOX Tool. easy converting AVI files to iPod - What is easy converting AVI files to iPod? Easy converting AVI files to iPod is converting procedure and you can easy play AVI videos on iPod. It's cool that IPod is equipped by video player. Convert MSG of Microsoft Outlook to MBOX - Easily convert MSG files of Microsoft Outlook to MBOX by the means of EML to MBOX Converter. Its batch mode conversion option, allows you to convert bundle of MS outlook messages to MBOX format with few countable clicks of mouse. RM Files Converter - RM Files Converter is an efficient tool for converting Realmedia files to other video or audio formats. You can convert rm or rmvb files to AVI, MPEG, DivX. Furthermore, you can extract the audio part of the realmedia files to AAC, MP3 or WAV. easy converting AVI files to iPhone - What is easy converting AVI files to iPhone? Video converter software is helpful for any computer user who watches videos on iPhone. Easy RM to MP3 Converter - Start converting RM files into MP3s with the Easy RM to MP3 Converter. It's fast, free and easy to use. Available for both Windows and Mac. PDF Converter Professional - Now you can do so much more than converting PDF files into Microsoft Word documents! ScanSoft PDF Converter Professional 3 is an unmatched combination of conversion, creation, and editing features at a third the price of the leading PDFsoftware. Zortam Mp3 And Wav Converter - Zortam Mp3 And Wav Converter is an MP3 application for converting Mp3 files to Wav files and converting Wav files to Mp3 Files using lame. Easy-Pro Midi to Audio Converter - Easy-Pro Midi to Audio Converter is a software utility for converting midi files(. Free IMM to EML Converter Demo - Would you like to Convert IMM files to EML of Windows Live Mail, Outlook Express, Vista Mail? Then utilize IMM to EML Converter that can effectively convert IncrediMail EML with all header information. Converter for EML to PDF - Converter for EML to PDF become necessary when you have to get your emails of EML format into PDF format. Using EML to PDF Converter you can easily have eml files converted into PDF format.